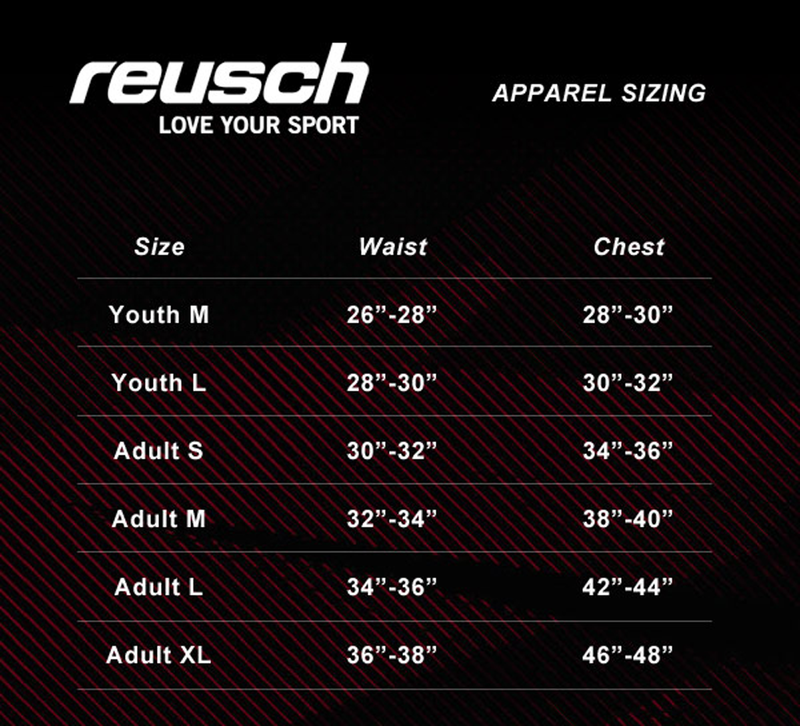 Reusch padded goalie pant available in youth and adult sizes. The Reusch Alex Goalkeeper Pant offers padding on the hips and knees. Contact keeperstop.com with soccer goalie pant sizing questions. The Reusch Alex Goalkeeper Pant is made of 100% polyester knit. It features a strap/stirrup on the foot to stop the pant riding up the leg during use. This padded goalkeeper soccer goalie pant has extensive padding on the hips and knees for protection. The Reusch Alex padded soccer goalie pant is also available in youth sizes small, medium and large. Great old school pant.Not a ton of padding and a little baggy.Runs a bit big for size but shrinks perfectly after being laundered a few times. Love the customer service. I left a message, got a call back w/in 10 minutes. Had the Goalie pants and goalie tights the next day. Excellent product. Timely delivery. Thank you. 10yr old goalkeeper, bought YM and fits perfect. Wears them 2-3x a week. Did not wear out for 8 months. Elastic waist and leg openings big enough for cleets, easy on and off. Great pair of Goalie Pants! My daughter is a lacrosse goalie. These pants are great for practice. We do not have to put on additional pads and gear. She has the flexibility to run the team laps without removing additional pads and shin guards. Pants were a little larger than expected but were exactly as pictured. quick shipping and they were a perfect fir for my son. My daughter loves them. She was very happy about how they fit and feel. My son has been using the pants for about 2 weeks now for indoor and outdoor. They are holding up well. Fit is good. Love the quilted padding. Orderd on Tuesday and received on Friday. The stirrup legs keep the pant leg down during those quick dives. Fits perfect. This is our second pair. The first one took 2 years to wear out. Great value for the money. Durable. Great product. Works as described. No complaints after a couple games. Shipping was fast and them within a couple days. I ordered pants for my 6 year old. Pants came in 2 days and fit perfect. Good quality. Perfect fit. My grandson has the 3/4 length pant and wanted the full length. He loves them. Great customer service and quick delivery. Product was exactly as described. Got to me much quicker than I expected them to come. I will definitely be shopping at Keeperstop.com again!